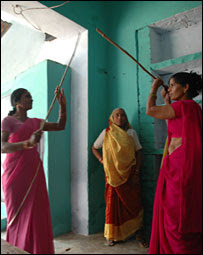 "They wear pink saris and go after corrupt officials and boorish men with sticks and axes." Indian States like Uttar Pradesh and Bihar are plagued with social evils of dowri, caste system and corruption. About two years ago, a group of women got together in the state of Uttar Pradesh and decided to fight corrupt officials and social evils. Apparently they have thrashed men who have abandoned or beaten their wives and unearthed corruption in the distribution of grain to the poor. They dress up in a uniform of pink sarees and have attacked a policeman after they took in an untouchable man and refused to register a case.The state's police force is known to be extremely corrupt and finally we are seeing the efforts of citizens to bring about a change. This is another example of the Bottom up approach seen in the Indian society where the ordinary citizens are fighting the evils of corruption. Uttar Pradesh is arguably one of the most backward states in India and very little of economic development has happened there. Hats off to these women for achieving what they have!